A major issue confronting wildlife nowadays is habitat loss. However in Palm Beach County, Florida, wetlands were created from land that previously was being used for other purposes. 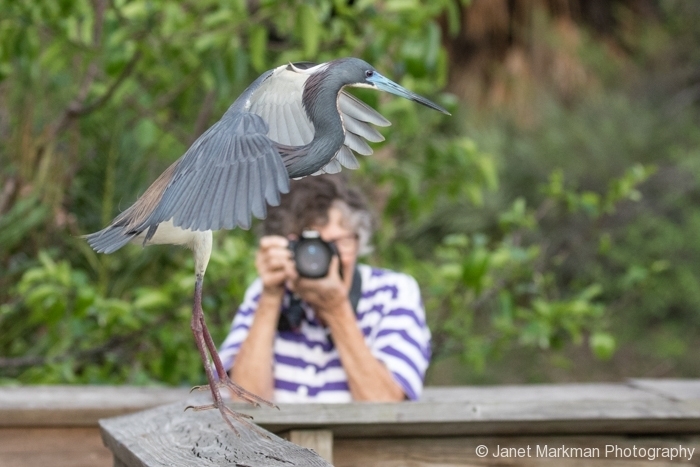 Today the Wakodahachtee Wetlands and Green Cay Wetlands are thriving ecosystems that allow people to get incredibly close to nature, especially birds. 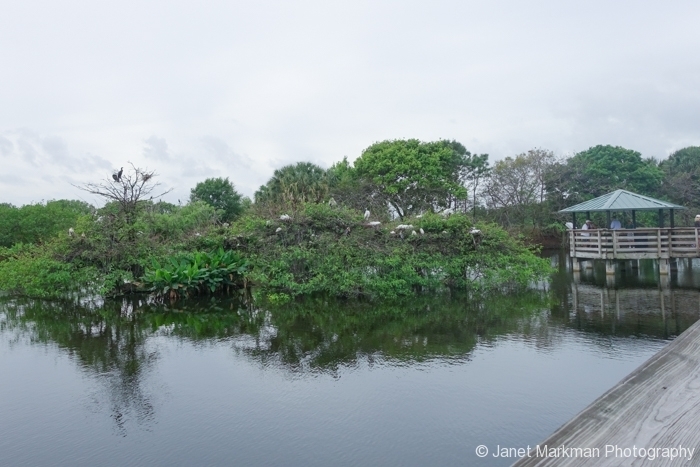 Let’s start with the Wakodahatchee Wetlands an idea first conceived of in 1992. The land making up for this park is located on 50 acres of unused utility land in Delray Beach. Between 1995 – 1996 this land was converted into recreational wetlands by the Palm Beach Counties Water utility. Ironically, the name Wakodahatchee comes from the Seminole Indian language and means “created water”. 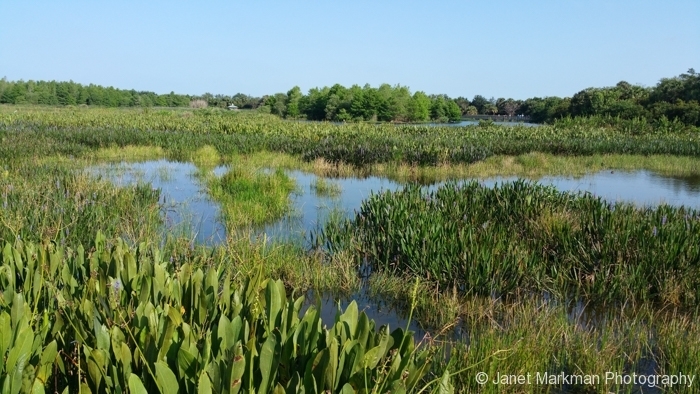 This space has been transformed into an Everglades wildlife ecosystem, comprised of open water ponds for diving birds, marsh habitats / shallow shelves for wading birds, intermittent tree islands with shrubs and snags that foster nesting and roosting, and patches of canopy forest made mostly of cypress hammocks. Each day, the Palm Beach County’s Southern Region Water Reclamation Facility pumps nearly two million gallons of highly treated water daily into Wakodahatchee Wetlands. The wetlands themselves, in turn, naturally cleanse, recharge, and filter the remaining nutrients, while allowing the water to be slowly absorbed back into the local aquifers to become fresh drinking water once again, supporting the earth’s natural water cycle. There is also ¾ mile boardwalk that goes through the wetlands. I found the tree islands amazing, where multiple bird species were nesting in one area. On one of these islands I observed Anhinga, Double-crested Cormorants, Great Blue Herons, Great Egrets, Cattle Egrets and Wood Storks all residing together. The Wood Stork is the only stork breeding in the United States and was previously placed on the Federal Endangered Species list in 1984, but in 2014 was down-listed from endangered to threatened. Some of the birds get really close as they swoop in low over the boardwalk to land on the trees where they nest or even land on the railing of the boardwalk just few feet in front of you. The nice thing I like about Wakodahatchee Wetlands is how close you can get to the birds without distressing them. One tree island lies approximately 20 feet from the boardwalk. I really enjoyed watching the Wood Storks gracefully flying in with big branches to build nests, nesting Great Egrets with their magnificent breeding plumage, the Great Blue Herons and the Anhinga’s feeding their chicks. 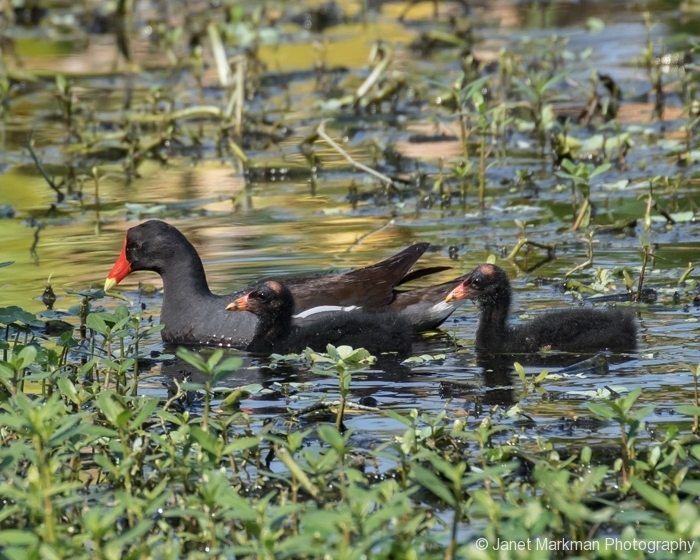 In marshy areas, Common Moorhen, Purple Gallinule, American Coots and Black-necked Stilts can be seen wading. Mottled ducks, Blue-winged Teals, Pied-billed Grebes were also observed swimming in the ponds. 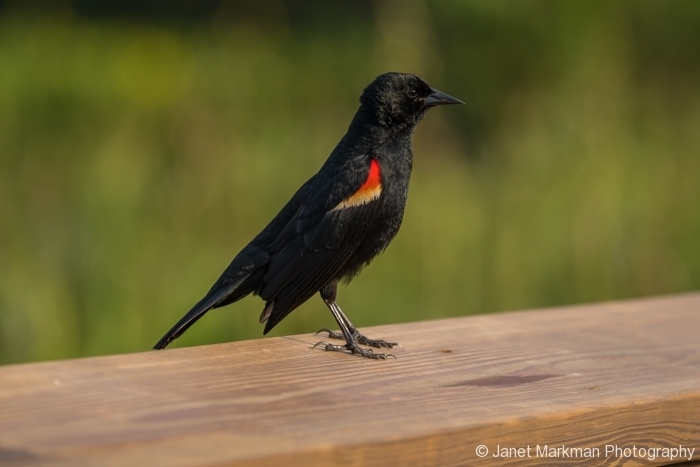 Boat-tailed Grackles and Red-winged Black birds also make their homes in the marsh and often will perch on the boardwalk right in front of you to pose for photos. 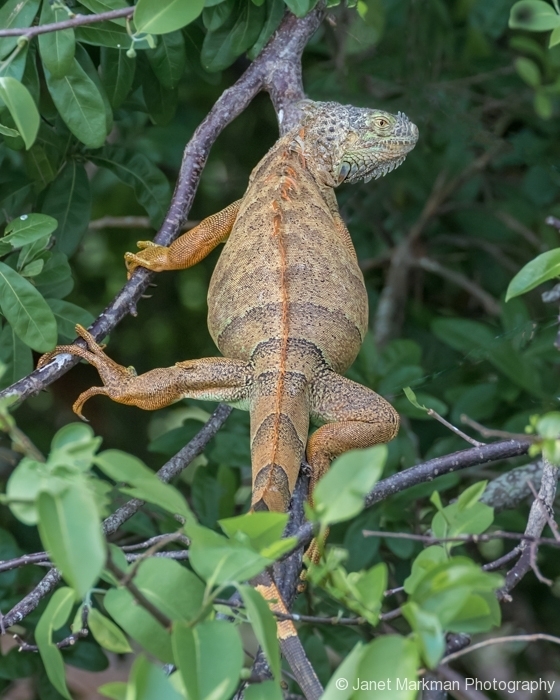 Of course, while the birds (150) reported species) are the main attractions, but you’ll find plenty of other wildlife, including Iguanas, turtles, alligators and marsh rabbits. The Green Cay Wetlands is approximately 2 miles from the Wakodahatchee Wetlands and was once a vegetable farm owned by Ted and Trudy Winsberg. This 100 acre lands was sold to Palm Beach County in 1999 under the condition it would be converted into a wetland ecosystem. Modified after the nearby Wakodahatchee Wetlands, construction began in July 2013, and was a cooperative project between the Palm Beach County Water Utilities Department and the Palm Beach County Parks and Recreation Department. Like the Wakodahatchee Wetlands, Green Cay was designed to naturally filter several million gallons of highly treated water daily from Palm Beach County’s Southern Region Water Reclamation Facility. Green Cay incorporates some 86 different species of trees, shrubs, and aquatic vegetation to which helps to recharge groundwater resources and maintain the earth’s naturel water cycle. There is a 1.5 mile boardwalk that take you through the different habitats which include Open Water, Shallow and Deep Freshwater Marsh, Cypress Swamp, Tropical Hardwood Hammock, Wetland Hammock, Cabbage Palm Hammock and Wetland Tree Islands. 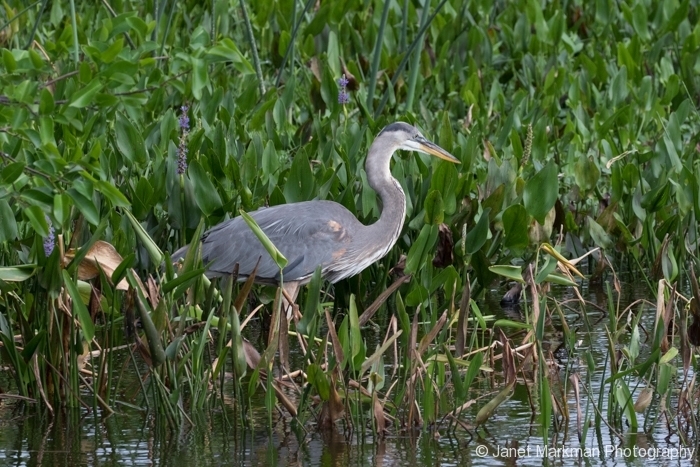 You will see a lot of the same wildlife in Green Cay that you see in Wadohatachee Wetlands. 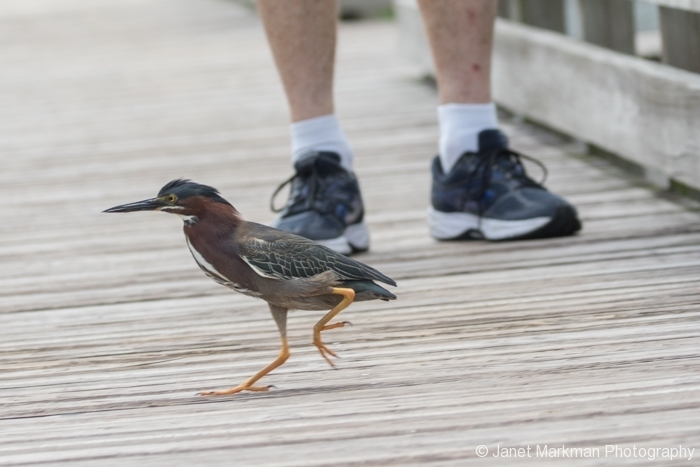 Large birds such as Anhingas, Herons, and Egrets can often be seen flying low over the marsh; sometimes even landing on the boardwalk and walking directly in front of you. I even noticed a Screech Owl tucked away in the trees blending in to the background so perfectly. Mottled Ducks and Common Granules can be seen swimming in the marshy ponds with their young. Egrets, Ibises and Herons can also be seen foraging and feeding in the marsh, along with Boat-tailed Grackles and Red-winged Black birds. Other intriguing critters include Alligators that can be seen swimming around, turtles basking in the sun, frogs on lily pads, as well as Raccoons and other mammals. I commend Palm Beach County for restoring land to a thriving natural environment where humans can co-exist and interact closely with nature. This is an excellent example of how we can responsibly preserve our natural environment and combat the threat of habitat loss faced by many animal species.